The main issue with the notion of a successful dynasty within any sport is that eventually it comes to an end. The ability to continually refresh and reinvent your squad and to adjust your playing style accordingly is a fine art that can be almost impossible to sustain. Eventually the sense of hunger that leads a club to create a dynasty fades as players and management become complacent in their own success. This is the natural order of such things and the ability to recover from a broken dynasty can separate the very best clubs from the rest. This Champions League tie in Paris had the feeling of the end of an era for Barcelona and the first step to the end of their dynasty. The Spanish side have been amongst the very best in world football for a decade now. The club defined a style of football that caught the imagination of people all over the world and led to numerous coaches trying to replicate what they had seen at the Camp Nou. You could form a strong argument indeed that Barcelona have defined football itself in recent years. This match however provided a Barcelona side that looked to be a pale imitation of itself. Lionel Messi was all but anonymous, Sergio Busquets was poor positionally and Andres Iniesta was showing signs that age was finally slowing down his feet if not his footballing brain. We cannot concentrate on the negative however as it has to be said that PSG were excellent throughout this match. They displayed the hunger and drive that only served to heighten the fact that Barcelona were so passive. In midfield the likes of Marco Verratti, Adrien Rabiot and Angel Di Maria were dominant both in the attacking and defensive phases whilst the loss of Thiago Silva in the centre of the defence went all but unnoticed as the 21-year-old Presnel Kimpenbe played superbly throughout. With the ferocious pressing and tackling from PSG they simply did not allow Barcelona to settle in to possession and the Spanish side had to face wave after wave of attack from PSG. There was a sense that the Barcelona coach Luis Enrique simply did not react to counter the threats posed by the opposition in this match and this has simply increased pressure on his position. Let’s start with the home side first. The German keeper Kevin Trapp started in goal behind a back four of Meunier, Marquinhos, Kimpembe and Kurzawa. The midfield three were Rabiot, Verratti and Matuidi whilst in the attack we saw Di Maria, Draxler and Cavani. Barcelona started with their own German keeper in Marc Ten-Stegen, in defence we saw Sergio Roberto, Pique, Umtiti and Jordi Alba. Their midfield had a familiar feel with Sergio Busquets, Andre Gomes and Andres Iniesta. The attack was as expected with Lionel Messi, Luis Suarez and Neymar. Part of the Barcelona ID that has engaged the footballing world for so long has been the way that they build their attacks through the thirds with every player from defence to attack capable and comfortable of collecting possession of the ball in tight areas and playing through lines of pressure in to the final third. This season however we have seen a definite shift in the capacity of this Barca team to play through high pressure. This sense that they are uncomfortable under pressure has only served to encourage more and more sides to use this strategy to unbalance Barcelona. The contrast in this match between the two sides was striking as one side were brave in possession whilst the other struggled to maintain their composure and string passes together. Here is an example where we see Barcelona in possession of the ball looking to instigate their attacking phase. From the four defensive players for Barcelona the French defender Umtiti is the least comfortable in possession of the ball. As he is carrying the ball there is no immediate pressure from PSG as they look instead to take away his passing options and force him to make a bad decision. The passes to Jordi Alba and Sergio Busquets have been taken away by the positioning of Cavani and Di Maria who are using their bodies to cover the passing lanes that Umtiti could otherwise have accessed. As Andres Iniesta reads the pressure and drops deep to support and offer a passing option we see both Verratti and Rabiot positioned to immediately press the Spanish international should be take possession of the ball facing his own goal. Contrast what we saw from Barcelona from the above image. Barcelona have four players in the advanced areas against four PSG players (including Trapp) the pressure and positioning from Barcelona however is incredibly passive. As Trapp plays the ball out to the feet of Rabiot on the edge of the penalty area the young midfielder is facing his own goal and he should be pressed quickly from two angles to try to turn over possession. Instead he is left in space and he displays the confidence in his own abilities to simply turn away and drive with the ball in to the middle third of the pitch, not one of the four Barcelona players looks to chase and pressure the ball. Indeed, this movement eventually leads to the third goal for Cavani as PSG progress the ball up the field. 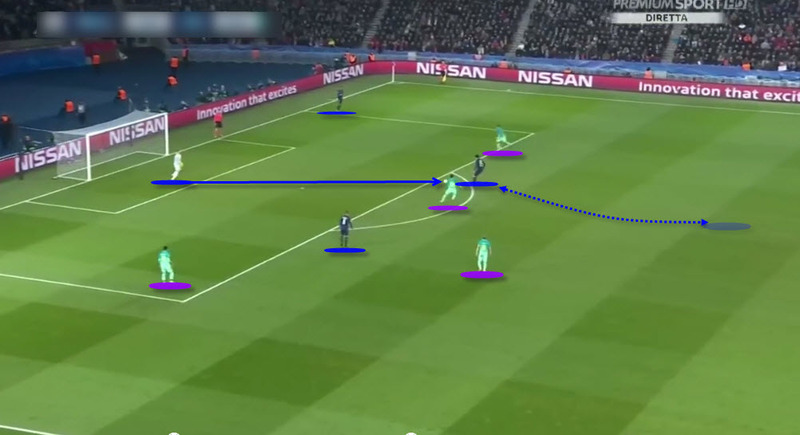 With the relatively poor performance in terms of pressing high up the field from Barcelona there is increasing importance on the deeper defensive structure being solid to deny PSG space as they build up towards the final third of the pitch. Traditionally this structure is well marshalled by the likes of Pique and Busquets who both read the game exceptionally well. In this match however PSG continually found themselves in huge areas of space as they progressed in up the field with the likes of Julian Draxler and Angel Di Maria finding themselves in one on one situations against their direct opponents which played to the strengths of the PSG players. Here you can see the immediate issues surrounding the midfield structure from Barcelona. As PSG have the ball on the left hand side with Julian Draxler in possession I have highlighted the positioning of the midfield three for Barcelona. Normally we can expect to see Sergio Busquets deep in the pocket of space between the defensive line and his midfield partners. Instead he is more or less flat in the centre of a three-man line who are poorly positioned to track the runners from PSG. Immediately there are two PSG players free in the space of the field that I have highlighted where they will be able to cause huge issues to the Barcelona defensive structure should they take possession. 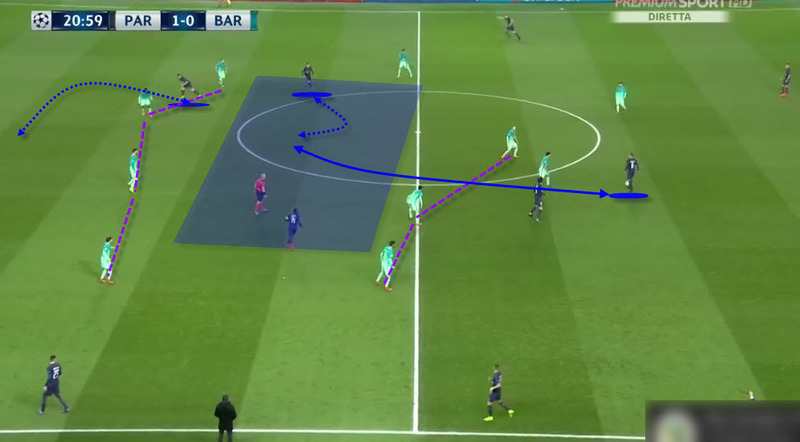 Here once again I have highlighted the positioning of the Barcelona defenders as PSG look to transition in to a quick attacking movement. The defensive line is extremely poor with Cavani pinning Pique in to the deeper position with his positioning. The rest of the line has been drawn forward with the left back completely caught out in no man’s land. 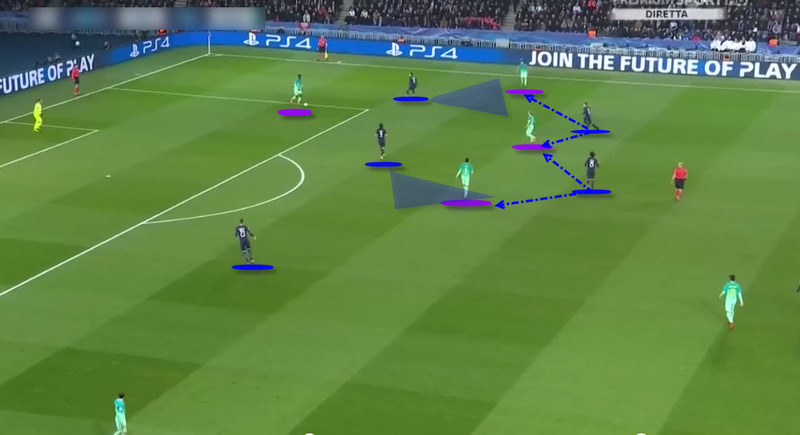 All that it takes is for Rabiot to play the ball through the channel between the centre back and full back and the PSG player is able to burst through unchallenged in to the space behind the Barcelona defensive structure. This great Barcelona side was built on their ability to keep possession of the ball in the final third and in particular the brilliance of the partnership between Xavi and Andres Iniesta in the centre of the field. It is no small compliment to state that the Italian midfielder Marco Verratti would not have looked out of place in that famous Barcelona midfield. Before going off in the second half with a knock the Italian ran the match for PSG. He was in constant motion looking to support the ball across the width and the depth of the field where he was always in position for his teammates to find. In possession of the ball Verratti was a metronome controlling the tempo of play and teasing passes through the Barcelona defensive structure time and time again. Here the Italian midfielder has possession of the ball in his own half of the field in front of the opposition midfield. Once again the Barcelona midfield is flat and poorly structure and there is a huge pocket of space between them and the Barcelona defensive line that PSG can exploit through simple movement. Cavani is the most advanced player and he is keeping the defensive line from stepping out by threatening to run in behind to threaten the goal. Verratti has the composure and the quality to pause on the ball and wait for his teammates to move in to the correct position. When the time is right Verratti slips the ball through the midfield line and in to the space with pefect weight for his teammate. This is taken from the moments immediately before the second goal for PSG. As Verratti has possession in the final third he does not simply look to aimlessly pass the ball to a teammate but instead he drives straight at the heart of the Barcelona defensive line. Cavani is static centrally but on the left Di Maria is moving up in space and on the right Draxler is mirroring that movement towards the Barcelona box. Verratti carries possession of the box towards the edge of the area choosing the exact moment to release the ball in to the feet of Draxler for the German attacker to beat Ter Stegen across the face of his goal. We have to accept that in this match PSG were every bit as good as Barcelona were bad. They take a 4-0 lead to the Camp Nou for the second leg and on the back of this match they are overwhelming favourites to move on to the quarter final stage. Indeed, this could go down as the time that PSG graduate from potential challengers for the trophy to genuine contenders. How will Barcelona react? Will the players rediscover their hunger and motivation or is this indeed a sign that the powers at the club have to reset and break this side apart before building up again in the mould of that great side of the last ten years. Either way it will be an interesting narrative to follow.